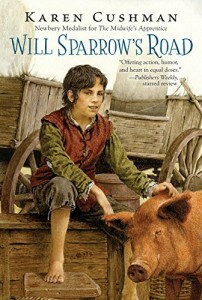 From the opening line of drama in this historical fiction for children, I was hooked. I had picked up the book at a local bookstore, attracted by the author, Karen Cushman, whose other works of historical fiction have been terrific. The opening of the book left me no doubt that I was in the hands of a master craftsperson. Cushman’s ability to use language to craft a different time and place is exceptional. Her writing is compelling, even when we are reading words that we are not familiar with. The special feature of this children’s book is the focus on a young boy as the main character, which for Cushman was a new focus. There are some ways that the book reminds me of the Whipping Boy, with a similar time period and focus on the life of a boy in the middle ages. The character in this historical fiction is, of course, fictional, but one gets the sense that many young boys may have had similar experiences, thrust out on their own to find their way, without support of families. It makes our modern day complaints seem quite trivial. This children’s book would be great in a classroom setting – my sense is that it would work well in sixth or seventh grade in a Waldorf school; possibly fifth grade. It would also work well in a home school curriculum. There is much to discuss in the book that is so different from today’s world, especially regarding ‘oddities’ such as Will encounters in the fairs. Nonetheless, the story is first and foremost about finding oneself, even if everything has been lost.